Has anyone ever made super-critical Mercury? What does it/would it look like? Source of the post Has anyone ever made super-critical Mercury? What does it/would it look like? Unfortunately, while I have been able to find a number of papers describing measurements of its properties, such as the change in the speed and transmission of sound through it, and its electrical conductivity, many of these papers are not freely available, and I have also not yet been able to find any papers or images describing or showing what the supercritical mercury looks like. However, I think we have a good clue from those other properties. From the abstract of the study investigating its electrical conductivity, it is reported that a bit to the right of the critical point (at 1790K), the conductivity increases dramatically (by 4 orders of magnitude!) as the pressure is increased. The vapor transitions from acting like a non-metal to a metal! Other studies have similarly described this transition. A key feature of metals is their shininess. This is because light is absorbed very quickly in the material as it excites the free electrons to move, and they also re-radiate the light backwards. So if there is a metallic region in the supercritical phase of mercury, I would have to guess that it would also be shiny and opaque. Which is really weird and fascinating to contemplate! Thanks for responding. I really wonder what that opaque reflective metal substance would look like. I think it would be more like a red/white substance since the mercury might glow red-hot or even white-hot when it gets that hot. Fascinating that mercury's conductivity is dramatically increased as it heats up to supercritical, makes you wonder. I figured Mercury would have the least extreme critical point because of its relatively low boiling point, but is there another metal (maybe cadmium?) that has a lower critical point? Maybe it shows the same properties. What prevents us from perfectly modelling what these properties are? Or, to turn the question upside down, by measuring these properties what new fundamental knowledge of physics do we get? Source of the post I think it would be more like a red/white substance since the mercury might glow red-hot or even white-hot when it gets that hot. Fascinating that mercury's conductivity is dramatically increased as it heats up to supercritical, makes you wonder. Yeah, I discount the thermal glow, which would probably be an intense yellow and very bright at 1800K. This is similar to the temperature at which wrought iron melts. So at these temperatures and pressures visual inspection of the substance would not only be fairly difficult, but also perhaps not very revealing. So it's really a separate transition from becoming supercritical. What's happening is that increasing the pressure increases the density, and this brings the atoms and the electrons closer together, until they (in some complicated way) form a conducting "sea" of mobile electrons, just like in a metal. 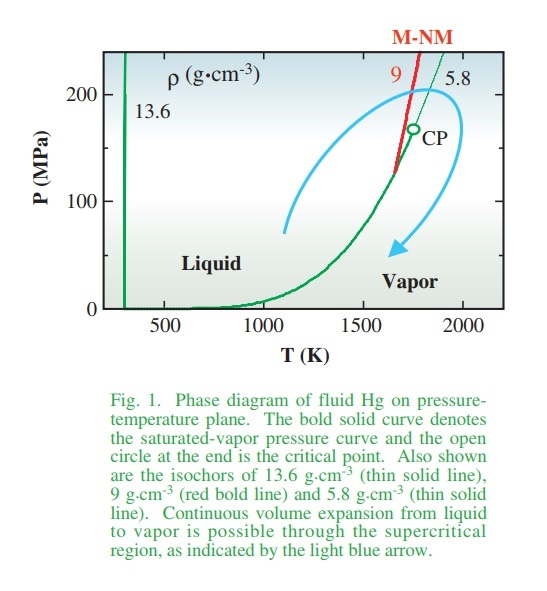 I had never heard of this transition occurring in supercritical fluids before. It's very interesting. I wonder if it also has similarities to the transition of hydrogen becoming a liquid metal? Source of the post I figured Mercury would have the least extreme critical point because of its relatively low boiling point, but is there another metal (maybe cadmium?) that has a lower critical point? Maybe it shows the same properties. Apparently, nobody has determined the critical point of cadmium! But I would guess it must be higher than mercury, since the melting and boiling points are also higher. Sodium does have a known critical point (2573K and 350atm, based on extrapolation), and potassium (2198K and 153atm, directly measured). The idea of experimenting with high temperature and high pressure sodium or potassium terrifies me by the way. Source of the post What prevents us from perfectly modelling what these properties are? Another really good question. This falls under the subject of "condensed matter physics", which is one of the most active fields of experimental and theoretical physics today. A fair number of faculty at my university do research in it. And the short story about it is "it's very complicated". The key problems for predicting the properties of condensed matter lie in accurately modelling the inter-atomic forces, lattice structure and modes of energy storage (if a solid), and the behavior of the electrons. The electrons may even be the most important and complicated part of it all. Electrons bound within atomic orbitals determine how the material bonds and behaves chemically, as well as its magnetic properties. Unbound electrons determine the electrical properties. But computing either is an extremely complicated quantum mechanical problem. Not because it uses quantum mechanics (for which we have a very good theory), but because the system is difficult to model and apply it to. For example, the unbound electrons move about the material, but still feel forces due to each of the atomic nuclei (so we must solve the Schrodinger equation for the electron with the potential it feels from the atomic lattice). We must also account for the electrons being fermions (no two occupy the same state), and that the electrons also interact with one another! In solids this leads to the theory of electron band structure, and something similar happens in fluids. So in general, there are nice trends and a range of models we can use to understand or predict the properties of many materials, but accurately predicting the properties of any material ab initio is quite hard, especially for more complicated ones or in more unusual conditions. It can be common to get significant (10s of percent or more) errors compared to experimental results. It is also possible for nature to do something unexpected (superconductors and superfluids were experimental surprises). For the metal-nonmetal transition in particular, it turns out there is a deep history of research and understanding of it (and this research is still active). 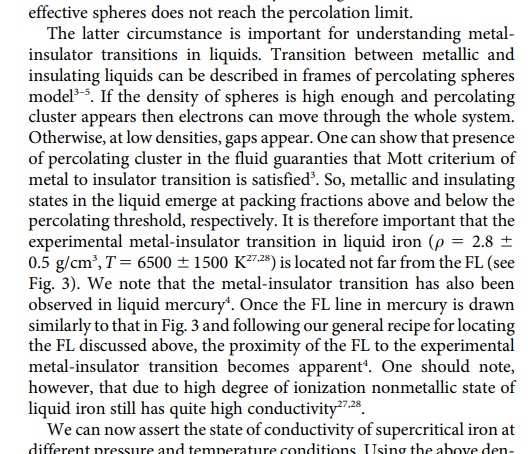 The paper I got the above phase diagram from (A Peculiar Fluctuation in the Metal-nonmetal Transition Observed in the Supercritical Fluid Mercury) has a very nice review of this in the introduction. The transition was actually predicted by Landau, who was awarded the Nobel Prize in physics in 1962 for his other work on condensed matter. What help does measuring this transition experimentally do for our understanding of the physics? It might help give some insight on how well this conceptual "sphere-packing" model works for describing it, or how to modify or replace it with a model that predicts it better. For a historical analogy we can look back to the successive iterations of models for the heat capacity of a solid, where multiple physicists (Einstein, Nernst and Lindemann, Debye) worked out how to understand and predict the behavior in different regimes of temperature. As an aside, with all this talk of "supercritical fluid" which might be unfamiliar to some, I wanted to show what it looks like, in the case of carbon dioxide. The essence of a supercritical fluid is that the boundary between liquid and gas phase disappears. If a liquid becomes supercritical, then the interface literally vanishes. It's very trippy and interesting. 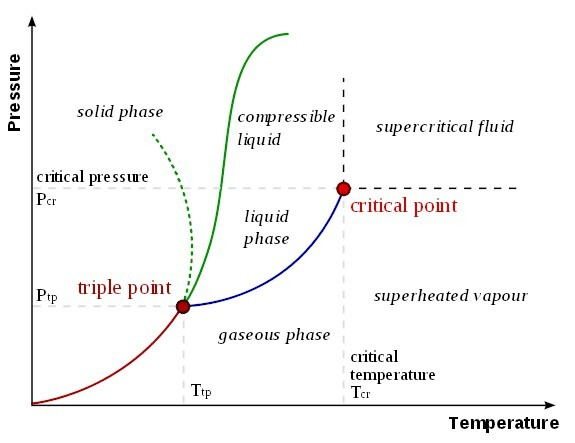 Supercritical fluid must also not be confused with "superfluid", which happens at very cold temperatures and is associated with the liquid losing all resistance to flow (zero viscosity). Source of the post If a liquid becomes supercritical, then the interface literally vanishes. It's very trippy and interesting. Yes, there are a fair few interesting things about supercritical fluid! It's used for a lot of stuff, from micronization to dry-cleaning. If you look at its wikipedia entry, its applicant uses are almost endless. Isn't liquid hydrogen (such as that in the deeper regions of Jupiter's clouds) a supercrit. fluid? What are some of its other more interesting properties? In this case it is testing a model of dark energy rather than dark matter (specifically, whether accelerated expansion can be explained by how our space might be embedded in some higher dimensional geometry, and if this could also explain why gravitation is so weak, as if it is "leaking" into other dimensions which is popular idea). I'm not surprised that the answer is "no", but it's neat that the question is even answerable! The combination of gravitational waves and electromagnetic observations is very powerful. We can draw a similarity to testing models of dark matter though. In most cases it is difficult to distinguish between dark matter as "a flaw in our understanding of gravity" and "there is actually more matter there". It almost seems untestable, as anomalous motions could be explained either way. But because there are mechanisms by which large amounts of dark matter and regular matter can become separated in space, and because gravity distorts space-time which bends light rays, we can use gravitational lensing to map the sources of gravity and see that there are distinct regions where dark matter is prevalent over regular matter. So the difference is testable. A nice trick that would not be possible without the effect of space-time geometry. Are Martian volcanoes actually supervolcanoes? On Earth, tectonic plates move over hot spots so that a supervolcano leaves behind a chain of calderas, but the terrain does not elevate much, if at all. Since Mars does not have plate tectonics, hot spots can pile lava up into enormous heights over millions of years. Arsia Mons caldera is 110 kilometers across, which is about the length of Lake Toba. Judging by the size of Martian calderas, I feel like the bigger ones may have been formed by VEI-8 eruptions (or perhaps even stronger? ), which define a supervolcano. Source of the post Are Martian volcanoes actually supervolcanoes? They are more closely related to Earth's shield volcanoes like Mauna Loa, than to supervolcanoes like Yellowstone. Rather than erupting explosively, shield volcanoes are built up by eruptions of fluid lava. The difference depends on the chemistry of the magma feeding it, and the surrounding rock that may be melted and mixed in. Watsisname, to sum up what this wikipedia page says, volcanic explosivity index (VEI) measures the power of a single volcanic eruption based on the volume of ejecta it produces, regardless whether it is lava, ash, gas or other materials. It is a decadic logarithmic scale. Ten times more ejecta adds one step up to the scale. Shield volcanoes on Earth do not produce strong eruptions, but erupt continuously like Kilauea or Erta Ale (VEI 0 or 1 mostly). Mount St, Helens eruption of 1980 was VEI 5. That of Krakatoa was VEI 6. Eruption of Tambora in 1815 caused a Year Without Summer, it was VEI 7. A volcano has to release at least 1000 cubic kilometers of material to pruduce a VEI 8 eruption. And these create huge craters. I found a page comparing volcanoes on Earth and the already mentioned Lake Toba to Olympus Mons caldera. It kind of looks like Yellowstone in size, except that the calderas are laid on top of one another, instead of in a line. Lavas are ejecta if they are explosively launched into the air (the general term then is tephra). Otherwise fluid (effusive) lava eruptions are not ejecta -- I don't think it would make sense to count them towards an explosivity index. Yeah, much of those eruptions were flood basalts and wouldn't count toward VEI. 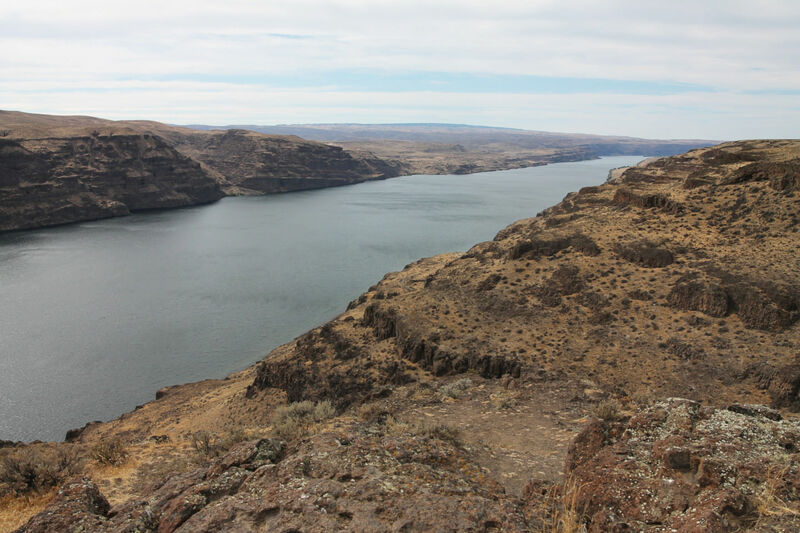 There are similar flood basalts through huge parts of eastern Washington and Oregon -- (the Columbia River Basalt Group) -- which erupted an estimated 174,000km3 of material about 15 million years ago. (And it shows -- the entire countryside out there is basalt rock. It's very surreal when you think of what created it.) But this isn't considered a supervolcano eruption, because it came out more or less continuously over a very long time, rather than explosively all at once. Explosive eruptions leave behind particular geologic evidence of tuff and tephra deposits, whereas with these we're basically looking at enormous lava flows. The Siberian Traps eruptions appear to have had some explosivity to them, but understanding the reason is a bit subtle. Apparently it was not so much the flood basalts themselves, but that some period of the eruption involved magma bursting up through areas with carbonate rock or other carbon-rich material, vaporizing it. This released huge amounts of CO2 into the atmosphere which warmed the planet, acidified the oceans, and resulted in the worst mass extinction known in Earth history.